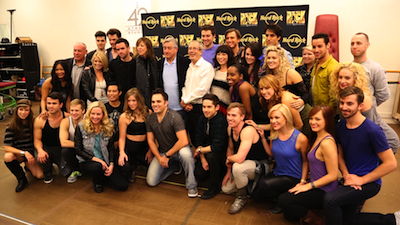 As We Will Rock You prepares to set out on its first national tour, the cast of the Queen tuner met with members of the press on September 23. Before rehearsal, the young company members got a thrilling surprise when Robert De Niro arrived to greet them! The two-time Academy Award-winner’s Tribeca Theatrical Productions is a producer of the rock ‘n’ roll musical, which has been playing London’s West End since 2002. In the Hot Shot above, De Niro poses with stars Brian Justin Crum (Galileo) and Ruby Lewis (Scaramouche), then joins the entire company for a souvenir photo. The Hollywood legend later sat front and center looking pleased as the cast performed two production numbers from the high-energy show. The national tour of We Will Rock You will open at Baltimore’s Hippodrome Theatre on October 15 and head to Pittsburgh, Boston, Minneapolis and more throughout the 2013-2014 season.